The Coloplast Self-Cath Tapered Tip Coude Catheter family of latex-free catheters from Coloplast offers patients a variety of options for intermittent self-catheterization. 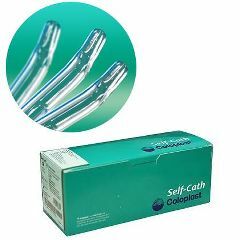 Each Coloplast catheter is made with the highest quality standards dedicated to patient co1mfort and ease of use. The Coloplast Self-Cath Tapered Tip Coude Catheter is 100% latex-free with fire-polished eyelets and a siliconized surface for smooth insertion. This catheter features a Guide Stripe which assures proper placement of the angled coude tip. easy to use..coude tip is. Why don't all coude catethers have a guide stripe? the stripe spares unnecessary irritation. Ease to use while traveling. Why use a tapered tip vs a straight tip? The tapered tip works best for the Malone or ACE procedures where the openings are much smaller inserting the tip into the abdomen or belly button. When urinary catheterizing I have found the regular blunt tip is the best.